Sommpi – Asia : SM Entertainment (SM) is joining hands with CT Corp and entering the Indonesian market. 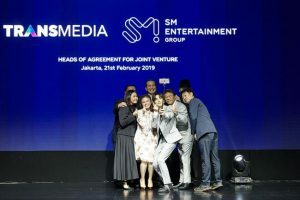 On February 21, SM announced its plan to establish a joint venture with Trans Media, a comprehensive media company under CT Corp, at the Grand Hyatt Hotel in Jakarta, Indonesia. CT Corp is a business group leading the media, finance, and retail sectors in Indonesia. Through their joint venture, they will focus on four areas including entertainment and content production, comprehensive advertising, lifestyle business, and digital business. Rossa was introduced as the first artist to be recruited by the joint venture company, as well as news of her collaboration with Super Junior, which is scheduled for the second half of this year. Super Junior’s Leeteuk and Rossa attended the ceremony to express their expectations for future activities. Rossa made her debut in 1996 and has won the Best Singer Award at various awards ceremonies. In September 2018, she participated in the main stage of the opening ceremony of the Asian Games in Jakarta and proved once again that she is a representative singer of Indonesia. Super Junior, one of the most beloved K-pop idols, is also much loved in Indonesia, and along with the collaboration project, they are expected to be more included in the joint venture projects. Moreover, the joint venture plans to promote the entry of SM artists into Indonesia, the production of I-pop (Indonesian pop) contents through the discovery and recruitment of local artists, and the production of video programs, which are expected to bring about huge achievements by actively targeting the largest market in Asia with more than 100 million young consumers out of 260 million people. In addition, chairman Chairul Tanjung of CT Corp, president Atik Nurwahuni of Trans Media, general producer Lee Soo Man of SM, CEO Han Se Min of SM, and branch manager Han Kyung Jin of SM South East Asia attended the ceremony. Meanwhile, SM and CT Corp signed an MOU for joint business promotion in October of last year. CT Corp is the largest group in the media, lifestyle, entertainment and financial sectors, with businesses such as TransTV, Trans 7 Channel, Bank Mega, Bank Mega, Syariah, Transmart Carrefour, and Trans Fashion.